Sustainable Waste Management has proved to be a gigantic challenge for the cities in India. For years ULB’s and successive local governments have found it challenging to equip cities with institutional and technical support, to combat the problem of increasing waste generation and scientific disposal. The outcome has been nothing short of horrendous with dump yards mushrooming in the residential areas and landfills overflowing beyond their original capacity with mixed waste. As per an estimate by Global Methane (a global partnership group working on methane emissions), currently, India disposes a whopping 90% of its solid waste unscientifically in the landfills. A lot of alternative solutions to waste have been studied and applied globally, one of them being Waste to Energy (WtE). Under this technology, energy is produced via waste through a combustion plant with controlled emissions. Many developed countries such as Germany and Sweden have tried and were successful in the application of technology, registering a low emission rate. 20th Report of Parliamentary Standing Committee on Energy studied the issue of Power Generation from Municipal Waste in detailed and it suggests that use of this technology is still in infant stage in terms of adoption in India, with only 8 to 9 plants functioning across the nation. Though recent cabinet decisions have extended support to this technology by providing 100% procurement of WtE energy and funding through Viability Gap Fund under Swachh Bharat Mission. An extensive study was conducted by Amanda Castolina and others from Deft Institute of Technology on WtE adoption in Delhi. The report used Functions of Innovative Systems (FIS) approach to study the dynamics of the technology by separating the waste regime and energy regime. The proper and efficient segregation of the municipal waste remains the biggest obstacle in the fruitful implementation of the technology. Other issues by the study were lack of expertise with municipalities to understanding the functioning of the PPP model and non-adoption of a focused approach. The report also compared the falling prizes of coal and oil with the high cost of energy generation through WtE technology. Domain experts like Isher Judge Ahluwalia & Almitra Patel have highlighted the case studies of Delhi’s WtE plants quite often in their expert and op-ed writings. In their view, the WtE technology is counterproductive in nature and a big source of pollution. They have been vocal critics against the use of this technology. According to them, unsegregated waste contains chlorinated hydrocarbons (like PVC) that results in the release of dioxins and furans (ecologically hazardous fumes) when the waste is burnt at less than 850-degree Celsius. They advocate using compost and biomethanation methods until the technology is refined and made to be in sync with the current pollution and emission norms. A large number of reputed academic institutions like TERI, IIT Delhi, and IIT Mumbai are active knowledge partners with the Ministry of Energy and Renewable resources undertaking research and studies on the viability of the technology in India. The first plant opened in 1970 in Timapur, New Delhi for approx 5.7 million dollars but had to shut down due to financial constraints. 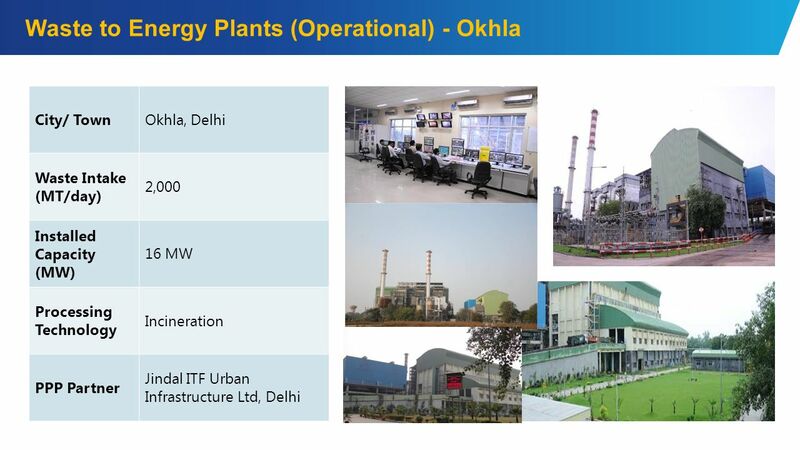 Now India has over 8 WtE plants with Delhi alone having 3 functional plants. Ghazipur, Narela-Bawana and Okhla. 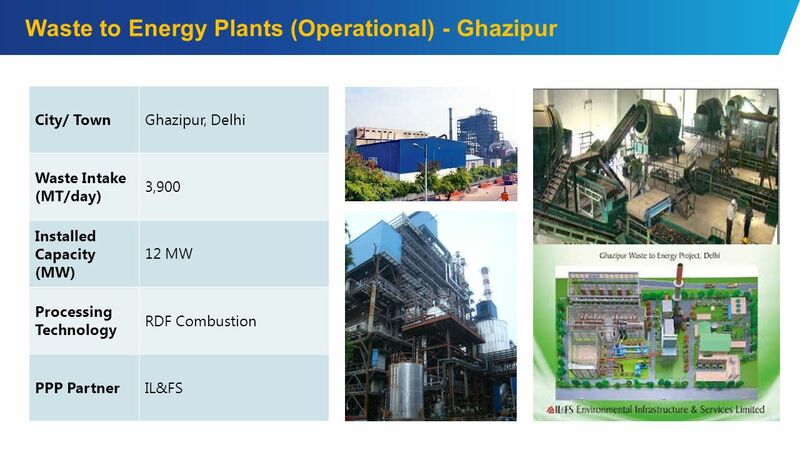 As per a media report, the plant at Ghazipur has a capacity to process 1,200 metric tonnes of garbage daily to produce 12MW electricity, the one at Okhla turns 1,500 metric tonnes of waste daily into 9MW electricity. The plant at Narela Bawana has a capacity to process 2,000 metric tonnes of waste to generate 20MW electricity. The interesting point to note is that all of these plants are facing severe protests by various social activists and citizen groups and official probes by the State Pollution Control Board for flouting various emission and land norms. Plants are working at different capacities in Pune, Solapur and Kanpur. Another plant was inaugurated this year on 2 January, in Kohlapur, Maharashtra, having a power generation capacity of 200 kwh per day. Thus it is safe to say the adoption and implementation of WtE have been a mixed bag in India and needs a uniform framework and direction for it to get wider acceptance. Unsegregated waste from households and commercial establishments remains the biggest challenge. As discussed above, the unsegregated waste is resulting in the low optimization of this technology. Also, the environmental costs are too high. The technology has failed to provide a piece of conclusive evidence that it completely an emission-free process. The lack of technical expertise with ULBs to understand the implications and operation of a PPP model and other related issues is also a major obstacle in terms of implementing this technology fruitfully across the nation. Putting things from the perspective of energy policy, WtE remains a very costly endeavor as compared to the cheaper alternative of coal and fuel. Generating clean energy from waste remains a distant dream and a challenging task. Role of different stakeholders will also be extremely important for the smooth implementation of technology, benefitting the people and the environment at large. Segregation holds the key for the high performance of this technology. The government should work at the policy level to attract private investors and encourage more & more R&D for developing a sustainable framework vis-a-vis WtE. Implementation of WtE technology in India has been a mixed bag. The nation needs a uniform framework and wider acceptability. There remains no doubt that with waste mounting and people flocking to cities, India needs innovative methods and techniques to develop a sustainable solution to waste management.